It wasn’t until this weekend when it was on Syfy that I finally got a chance to sit down and watch Battlestar Galactica: Blood & Chrome but I loved it! It really put me in the mood for watching some BSG again. I don’t know if there is a chance it will happen or not, but I would really love it if they made more in the Blood & Chrome time period as the mini series or whatever you want to call it was awesome! 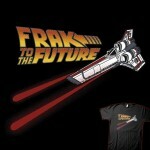 Speaking of Battlestar Galactica, it seems like a wonderful coincidence that the popular What the Frak t-shirt is on sale for just $11 over at BustedTees until Monday night! That is 45% off of the normal $20 price! 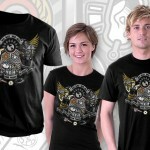 I suspect I will probably pick up this shirt sometime this weekend as it would go great with my three other BSG t-shirts. 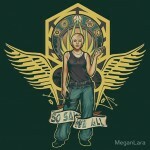 I have seen this shirt for sale at sci-fi conventions for several years but have never purchased it because I don’t like spending the really high convention prices for shirts if I am pretty sure I can find it cheaper somewhere else. Now that I have finally found it cheaper, I definitely will get one! You aren’t sure if you are going to buy one? 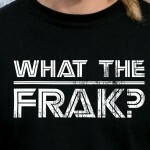 What the frak?! Just do it! 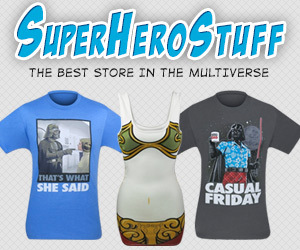 Share this with all of the Battlestar Galactica fans you know! Like us on Facebook too!